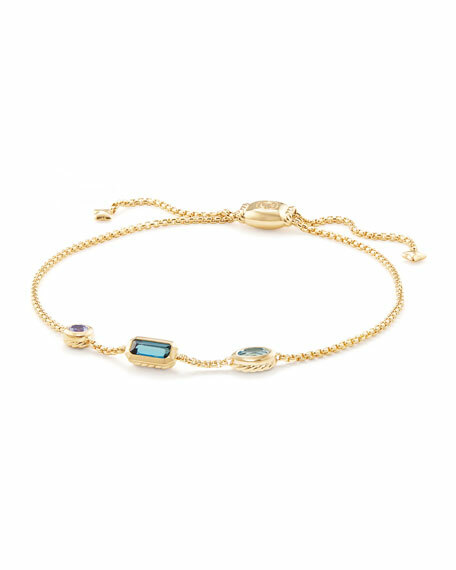 David Yurman bracelet from the Novella Collection. Polished 18-karat yellow gold chain and hardware. Blue topaz, aquamarine and tanzanite stations. Bracelet by David Yurman. Twisted sterling silver links. Pavé diamond accent links. 0.7 total diamond carat weight. Toggle clasp. Imported. Bracelet by David Yurman. Sterling silver. Carved links, 9.5mm. Toggle clasp with blue sapphire detail. Made in Costa Rica. 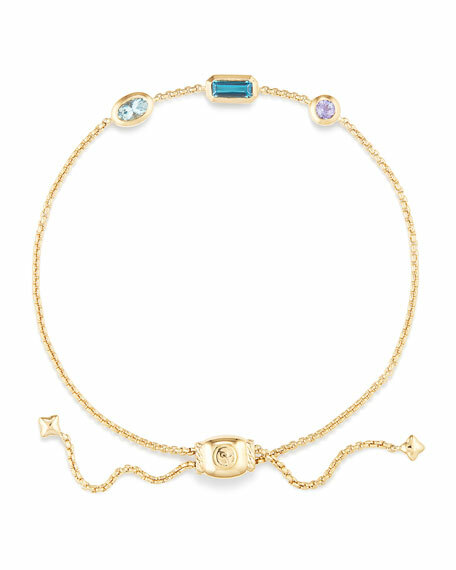 David Yurman bracelet from the Châtelaine Collection. Sterling silver or darkened sterling silver. Thin box chain. Round center station in your choice of black diamond, tsavorite, or blue sapphire pavé, 9mm. 0.15 total black diamond carat weight. Toggle clasp. Imported. David Yurman bracelet from the Continuance® Collection. Polished sterling silver links, hardware and clasp. Naturally white freshwater cultured pearls. Approx. David Yurman bracelet from the Continuance® Collection. Polished sterling silver links, hardware and clasp. Naturally white freshwater cultured pearls. Approx. 23mm. Box clasp. Imported.